Cell cultures are one of the major techniques in life sciences frequently used in research, development and production. Cells, tissues or organs are harvested in order to proliferate in an artificial environment. Cell cultures supplements are required for optimal cell expansion. Scientists have to mimic the in vivo conditions like controlled temperature or a substrate for cell attachment. Especially difficult to cultivate cells need appropriate growth medium and incubator that maintains correct pH and osmolality for the in vitro cultivation. 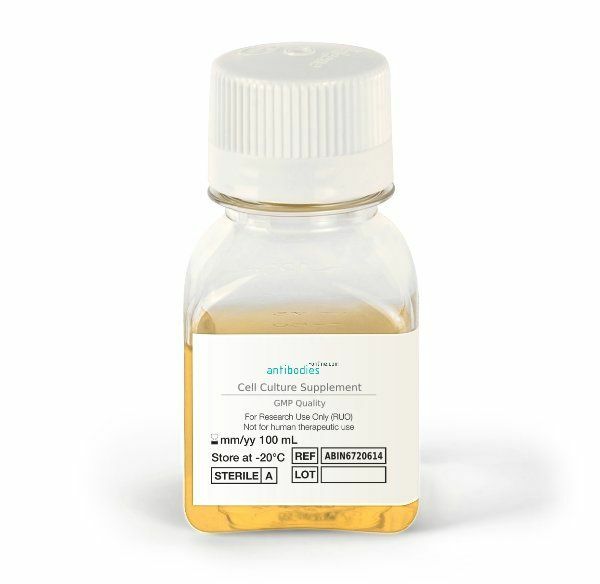 antibodies-online offers Human Platelet Lysates cell culture supplement that is a first-rate alternative to fetal bovine serum (FBS) in human cell culture medium. Human blood offers abundant growth factors and ensures this way a high cell performance . Human Platelet Lysate is manufactured from platelet units obtained from healthy blood donors at either FDA-licensed or EMA licensed blood centres. The human platelets are pooled in large batch sizes (>300) to ensure outstanding consistency in availability, pricing and the product itself. Figure 1 shows a comparison of bone marrow-derived MSC cell cultures and their respective proliferation rates. One pool of cultures used human Platelet Lysate (ABIN6720614) as cell culture media (orange), the teal data set used FBS. hPL population doubeling rate is almost twice as high in comparison to cell culture using FBS. 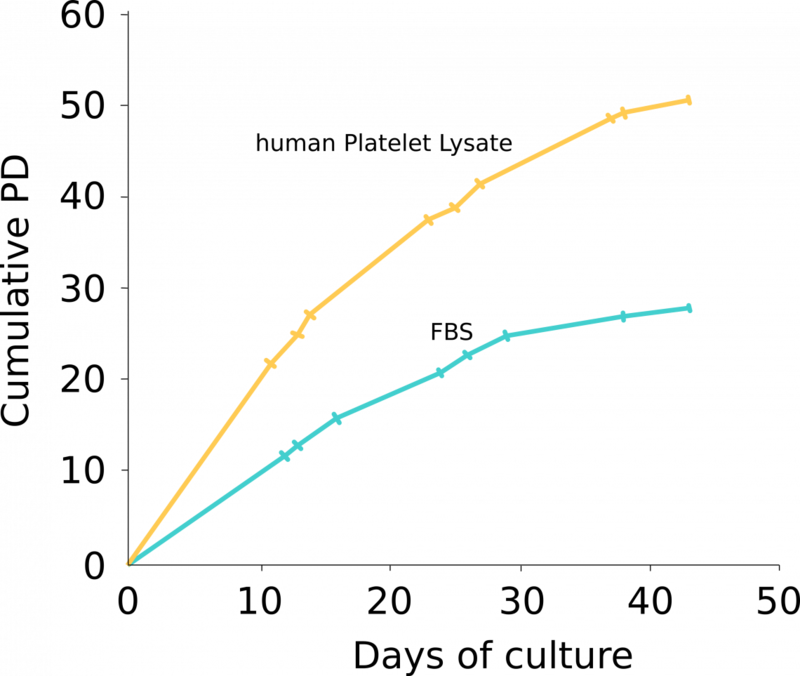 Fig 1: Cumulative population doubling of bone marrow-derived MSC was higher in human Platelet Lysate (ABIN6720614) compared to FBS. antibodies-online offers hPL with different safety grades to match all application fields. For the highest safety level for expansion of different human cell types, gamma radiaton is applied to platelets which reduces pathogens in the final hPL to a minimum. These human platelet lysates can be used, in contrast to FCS, in therpeutical development. Cell culture solutions based on human Platelet Lysate are suited for basic research, cellular therapeutics and clinical applications. Researchers establishing stem Cell Therapy treatments need to meet the regulatory guidelines and have a cost-effective system that is compatible with their end use. Especially for therapeutic applications, the ideal cell culture medium forgoes any animal derived components, provides equal or increased performance (e.g. cell proliferation, protein production, etc.) over serum, and is comparable in price. Human platelets contain coagulation factors, like fibrinogen, in order to react to bleeding. Adding heparin to the medium prevents clotting reactions in the culture medium1,2. In this case the anti-coagulant (ABIN6720635) is needed to prevent clotting. hPL products which are fibrinogen-depleted don’t require additional heparin. However addition of heparin is not advisable for every cell culture. Macrophage culture express heparan sulfate which is sufficient to act as an anticoagulant. Additionally heparin interferes with cytokine profile, releasing moreproinflammatory cytokines IL-1β -63. 3D cell system allows to utilize a more standardized cell expansion protocol. The two-phase system consists of a human Platelet Lysate gel, which supplies your cells with nutrients and a cell culture scaffold at once. 3D Cell Culture Matrix offers a uniform distribution of growth factors throughout the cell culture system. Cells can grow in several layers at the interface layer, which minimizes contact inhibition with any artificial biomaterials. It is recommended to use Gelation Accelerator which induces prompt gelation with the 3D Cell Culture System 3D Cell Culture Matrix. Cell culture media supplies cells with energy and compounds which regulate the cell cycle. A typical culture medium is composed of a complement of amino acids vitamins, inorganic salts, glucose, and serum as a source of growth factors, hormones, and attachment factors. In addition to nutrients, the medium also helps maintain pH and osmolarity. First cell culture experiments in the early 50s used natural buffers as cell culture supplements - biological fluids and tissues extracts from living animals. Their composition is complex and hard to reconstruct, this is why natural buffers are still used predominantly today. One of the first cell culture supplements used is fetal calf serum (FCS). Fetal calf serum contains a variety of proteins, not all of which are known today. These proteins also include growth factors that are necessary for the cultivation of cells in cell culture flasks. Over the years usage of fetal calf serum, for which about one to two million animals are killed every year, is criticized more and more. Another reason to search for replacements is that cell cultures produced with FCS can hardly be registered as therapeutic cells. The large number of unknown proteins can lead to severe side effects and allergies in patients. Furthermore, calf serum can contain impurities and transmit diseases (e.g. through mycoplasma). There is now a wide range of serum-free media for the cultivation of cell lines and stem cells. Other media such as human platelet lysate (hPL) or synthetically produced substitute sera are uncomplicated and inexpensive to produce. Since these media are produced from human material, they are better suited for the cultivation of human cells than fetal calf serum.